A Halloween party just isn't complete without some ghoulish beverages. 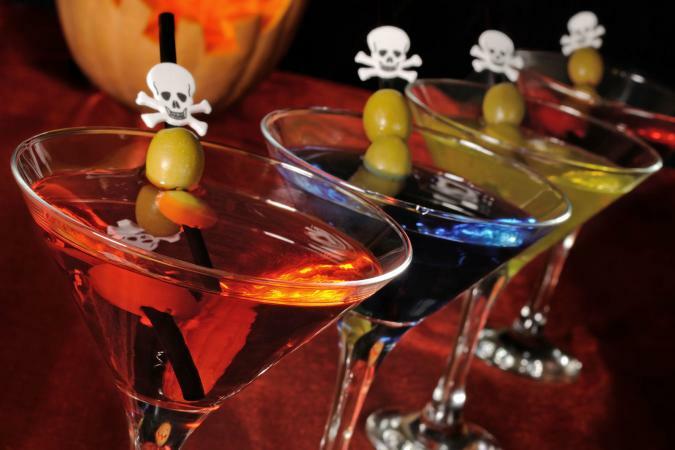 Try some delicious Halloween party drink recipes, with and without alcohol, that can liven up your next ghostly party. The following Halloween drink recipes are easily modified to accommodate the number of guests you will be serving. Note that both of these recipes contains alcohol. This fruity drink may cast a spell on all your guests! Combine all the above ingredients together in a large punch bowl. Garnish each drink with bloody eyeballs. Mix ingredients together in a large pitcher. Fill glasses with wormy ice cubes. The following drink recipes do not contain alcohol, so they're appropriate for guests of all ages. Mix the cranberry and orange juices together, thoroughly. Add the sorbet, and mix it thoroughly as well. Next, add the seltzer. Serve the drink with either swizzle sticks with eyeballs or ice cubes with body parts. Kids love this recipe. Combine thawed limeade, Sprite, and Gatorade in a Halloween punch bowl. Add drops of green food coloring until you've reached the desired shade of green. Place a dollop of whipped cream in each cup, and add cherry "eyeballs" as a garnish. Purchase some gummy worms, and freeze them in water in ice cube trays. Add the worm ice cubes to the drinks you serve. Purchase spooky stir sticks, like the ones available from Pick On Us, for added cocktail creepiness. Add green or orange food coloring to ice cubes to serve with drinks. Create bloody eyeball garnishes with cherries and chocolate or white chocolate chips. Remove the stem from the cherry, and replace it with a chocolate chip. Skewer two cherries on a swizzle stick, and add them to drinks. Serve blood red drinks in clear goblets. You can often find inexpensive medieval designed goblets at specialty shops. Nextag is a good place to look for options. Before the day of the party, get yourself organized. Plan out your menu, being sure to include drink choices. Remember that not everyone will want to drink the Halloween beverages you have on hand, so offer simple drinks as well, like colas, tea, water, and coffee. If your drinks will contain liquor, be sure you have enough on hand to last throughout the night. Consider setting up a bar, and have one person serve as the "drink master." If you have special recipes you'd like the bartender to use, go over those with him or her before the party begins. Note, of course, that alcoholic and non-alcoholic drinks need to be labeled very clearly. It's important that you don't run the risk of designated drivers consuming beverages that include alcohol by mistake. If there are adults and minors at the party, precautions are necessary to keep youngsters out of the cocktails. Consider assigning someone to making sure that only grown-ups have access to the drinks that include alcohol.